Most of the times gates are open which leads to entry of all kinds of vehicles in the premises. Security guards are ineffective in allowing selective vehicles in the premises due to lack of proper identification system. 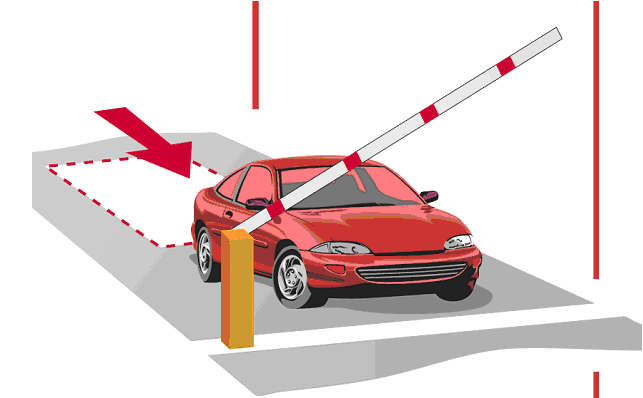 The system of opening the gate is manual and dependent upon the availability of guard. One vehicle follows the other without proper identification. Manual recording of events is prone to error. With this technology every vehicle whether stationary or moving can be networked and identified without the need of line of sight. Tags are tiny sensors that are pasted on vehicles. They have a unique identification number making the vehicle on which it is placed 'unique' and also some limited memory to store necessary data like vehicle no, UID no etc. RFID tagging and registration of vehicles is a one time process. RFID passive sticker type tag is pasted on front windshield for 4 wheelers and on front doom or on non-metallic surface of 2 wheelers. Unique number (UID) is generated and written ontothe RFID tag memory using RFID reader. RFID reader will be used to write UID and unique password for each customer, with the option to block re-write of memory. For security reasons UID is mapped with database at backend. LF & HF are being phased out, UHF and Active are expected to dominate the future. 2 MB Flash memory –Standalone system. Standard relay setup inbuilt –easy integration with any standard boom barriers. Ethernet interface –Access anywhere in the network. Can be easily integrated with any 3rdparty software. Provide complete solution –hardware, installation, integration, training and quick support. 23/A, Industrial Suburb, II Stage Tumkur Road, Yeshwanthpur, Bangalore - 560022. Copyright © 2017 by Raj Udyog All Rights Reserved .